The Forest Hill neighbourhood is not only one of Toronto's prettier districts, with gently sloping hills, winding roads, and charming parkettes, but it is also one of Toronto's most prestigious districts. Forest Hill is also home to two of Canada's most revered private schools: Upper Canada College School for boys, and Bishop Strachan school for girls. 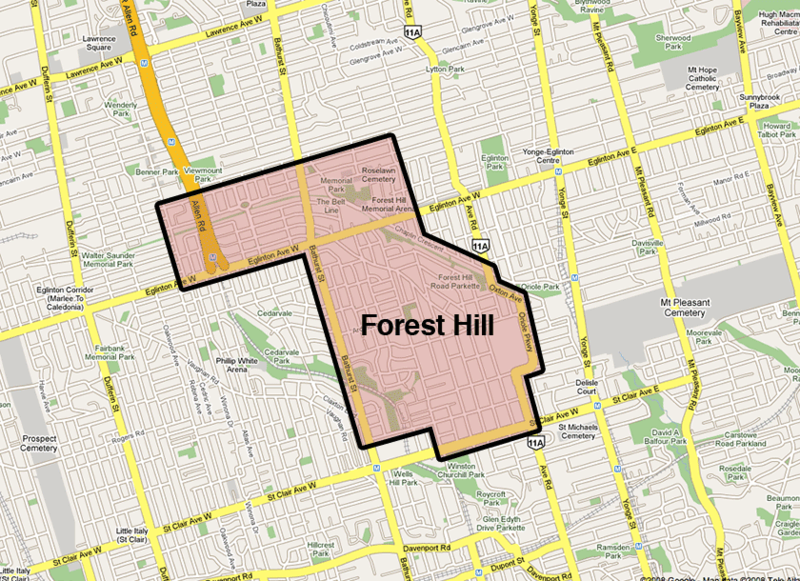 Forest Hill is divided into two neighbourhoods: Forest Hill North and Forest Hill South. Forest Hill North extends from Briar Hill Avenue in the north to Eglinton Avenue West in the south, and from Latimer Avenue in the east to Allen Road and Marlee Avenue in the north-west and south-west, respectively. Forest Hill South extends from Eglinton Ave West in the north to Tichester Road in the south, and from Bathurst Street in the west to Elmsthorpe Road in the northeast and Avenue Road and the Oriole Parkway in the east. There is an additional stretch of Forest Hill South between Bathurst Street and Spadina Road, north of Lonsdale Road. 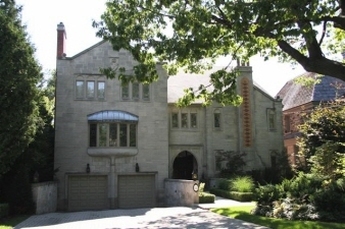 Forest Hill's old building codes and by-laws, dating back to the 1920's and 30's, required that all Forest Hill houses be designed by an architect, and that a tree be planted at the front of each property; leaving a legacy of beauty that enhances its reputation as one of Toronto's three wealthiest and most exclusive communities. And now, more than any other district in the central city, Forest Hill has become the site of spectacular new 'neo-traditional' homes built on a grand scale, usually with lawns to match. Above: Take a tour around 61 Elderwood Drive, one of the homes we have sold in Forest Hill. Interested in Buying or Selling a Forest Hill Property? We have extensive knowledge of the Forest Hill community. Please contact us if you have any questions about this prestigious neighbourhood.